Smooth, rolling singletrack (roller coaster), bombing downhill singletrack (viper, chris's crevice, indian camp), bombing downhill doubletrack (sunset, lake ridge, copperhead), technical singletrack (gary's gulley, flying flynn, wild irishman), and challenging climbs (wipeout, bottom of viper, turkey run, around the pond) all exist here (30 miles of trails!). Great location, mountain bike friendly owner, also has paintball, camping, and shower facilities. Best ride in the area! Review: The people at the retreat location are very nice and helpful but the trail leaves some to be desired. They are not to my liking due to how rough they are. There are a few fun sections but there is also a lot of work that needs to be done currently. Review: This was a super fun ride, but the trails were in direpair. I had to get off and walk around 5 large downed trees during a 9 mile loop. I think the owner has turned his attention to other things than ihs mtb trails. Review: I just rode here this last saturday. The guy who runs it is very nice and willing to hang out and talk. He has a black lab named Shadow who is very friendly. When we got there he was busy working with a group there paint balling. Shadow decided to come with us on the trails. We tried to get him to stay by the buildings but he decided to come with us. He stayed with us the whole time and it was fun to have hime with as I have never MTB with a dog before. I can tell that this can be a very fun trail system. Our problem was that the trails were so thick with leaves that it was difficult at times to tell where the trail was. I am used to riding on leaves, but there were too many leaves for me. Plus our bikes were sliding and not gripping at all on the downhills. Also the trails are confusing if you have never been there before. Even if you get lost it is easy to find yourself again, but the signs and trails can be confusing. I think that in the spring or summer I will give it a try again. The next day we went to Brown County State Park and had a much better riding experience. The trails there were cleared off and though it was a bit muddy it was still good. Review: Rode today. Trail was in excellent shape! 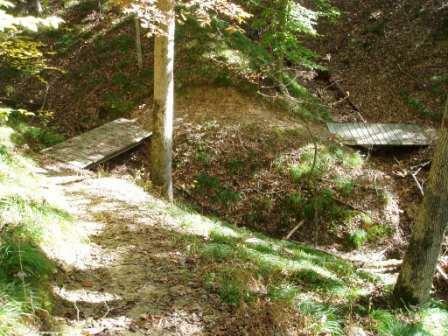 Review: I rode this trail in October and found it to be a non-stop, Southern Indiana technical assault with some climbs that completely cleaned out my carburetor, so to speak. Gary, the proprietor was excellent as the host of this quirky paintball-bunk house-mountain bike-compound. I stayed mostly on the blue trail which included some black diamond tracks as well. The trails are not overly traveled so there is almost no wash out/loose soil. Mature forest and beautiful valleys make for a good wilderness experience. The trail gets a little monotonous, for my tastes, only because of its relentless technical climbs and maneuvering, but it was my first visit and I bet I could find a way to customize the trail options (and there are many!) to make a ride which suits me. The trail is well marked and the map accurate. There is also an optional honor system, self register/pay if the owners are not available when you arrive. Review: rode on 2-26-06. was awesome till around noon when trails thawed. best ride in indiana in my opinion. go out and ride!!!! Review: HMBA is continuing to build trails. Added another .75 miles on Saturday, February 25th. When this section is connected to the rest of the Grandview Loop, it will be sweeettt! Review: todays ride was cold! trail conditions right now are treacherous.with the leaves down and the ground frozen makes a slick ride.still had a blast though. Valley Branch Retreat MTB Trail 4.40 out of 5 based on 11 ratings. 11 user reviews.